Our vest is to be worn over your scrub top and Operation Heatjac belt and under a typical scrub warm-up jacket. As some hospitals provide thin, what seems to be paper, "warm-up" jackets, having an insulting layer underneath to keep the heat in is needed. 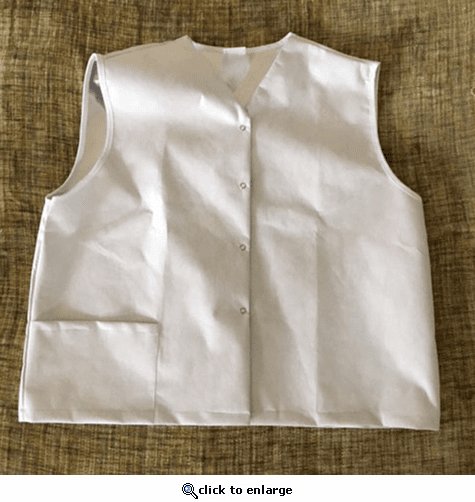 Our vest is Not a single or few uses product. It is washable (gentle cycle, hang dry), the same as our belts, once the heating pads and insulating pads are removed, and then replaced when dry. The vest pocket is designed and positioned to accommodate our 11.1V, 5200 mAh battery, and one may find this to be the more comfortable option over placing the battery within the second pocket of the double pocket of the belt located behind the insulating pad.